Got paper clutter? You’re in the right place. 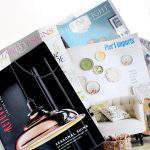 The One Pile at a Time Paper Declutter Challenge will help you banish those paper piles — one pile at a time! People have asked why I’m putting together an organizing challenge that is focused specifically on paper. The reason is simple. It’s hands down the most common organizing struggle that I encountered as a professional organizer. Not surprisingly, my blog readers have told me that it’s their main clutter kryptonite as well. I’m blown away by the number of people who have participated in this challenge over the past few years. Now I’m so excited to walk with YOU on this journey to a more organized lifestyle over the next few weeks! HOW DOES THE PAPER DECLUTTER CHALLENGE WORK? Enter your email in the sign-up for at the end of the post, you’ll receive a weekly email that outlines solutions for decluttering and organizing, as well as the assignment for the coming week (or if you prefer to access the assignments directly, you can simply click the links above). Tame the incoming paper first, then deal with the backlog. If you encounter a really busy week, and aren’t able to complete the challenge for a particular week, no worries! Simply skip that week and come back to it after the conclusion of Week 13. Completion of a particular challenge is NOT dependent upon completion of prior weeks’ challenge assignments. So by all means, do not quit if you need to skip a week! You can also choose to skip weeks for which the paper category is not applicable to you (e.g., you are an empty nester who has no school papers coming in). HOW DO I PREPARE FOR THE PAPER DECLUTTER CHALLENGE? There are three things that you can do to set yourself up for success. I’m not gonna lie. Organizing paper is no walk in the park. It can be tedious, it can drain your energy, and it is time-consuming. Let’s face it…that’s why most of us avoid it like the plague. In order to muster up the motivation you’ll need to continue to soldier on through those paper piles each week, it’s vital that you focus on the reasons why you’re doing it in the first place. What are your goals for the end of the 13 weeks? For some of you, it will be to rid your countertops of paper piles once and for all. For others, the goal is to spend less time searching for important papers. Some of you have had it with incurring late fees from bills that you misplaced and forgot to pay. Whatever your pain point, write down your vision for what your newly organized lifestyle will look and feel like at the end of the challenge. Refer to it often when the going gets rough. As with all organizing/decluttering tasks, you’ll need to make a firm commitment to making paper decluttering a priority this summer in order to “get ‘er done”. My best advice for your is to schedule appointments in your calendar each week in order to complete the challenge assignments. The length and number of appointments may vary, depending on how problematic each category of paper is for you. Treat those appointments as sacred! So the big question is, are you IN? 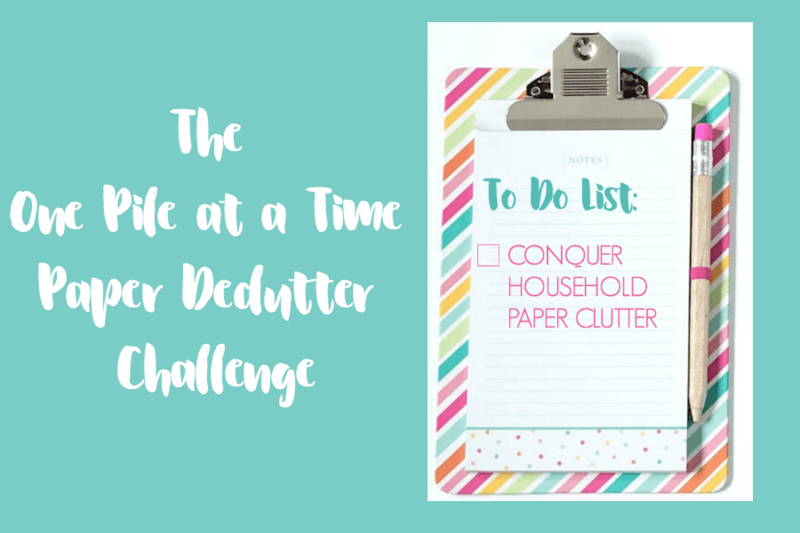 Join the One Pile at a Time Paper Declutter Challenge! Thanks for joining the One Pile at a Time Paper Declutter Challenge! Check your inbox now for your first Challenge assignment. 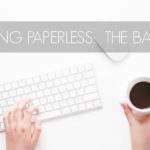 ~ Let's banish those paper piles! I'm so DONE with the Piles! Interesting to see “know your why” as the starting point. I give the same advice for marketing! I guess when it comes down to it, knowing why you’re doing anything is important if you want to succeed. Welcome Linda! Excited that you’ll be participating! Yey Jennifer! Glad to have you on board! Be sure to check back tomorrow morning to get your first assignment!